My buddy, The Endangered Sartorialist, ranked this restaurant highly and Mao Mao from farmland China has never been to a nice eatery so I brought him here to see see. This is the perfect place for Mao Mao because it’s cozy, unpretentious and not intimidating and at the same time, it has class. 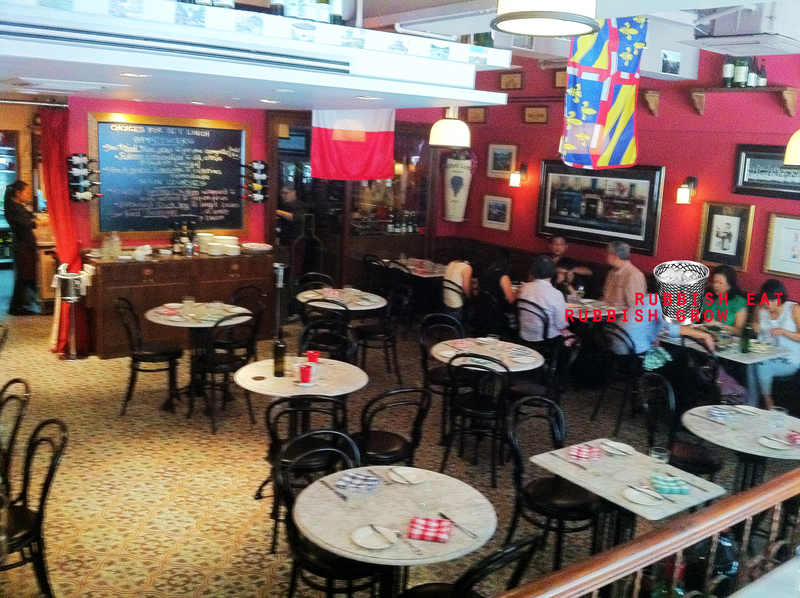 Under the Les Amis group, the decor of the bistro is very quintessentially French, with checkered napkins, mosiac-tiled floor, marble-top tables and windsor chairs. The lunch set menu starts from $30. Unlike some atas places which have limited choices for lunch, the choices here are extensive, choosing from the menu and from dishes on the blackboard which change daily. Excellent! Food, like life, is about options. 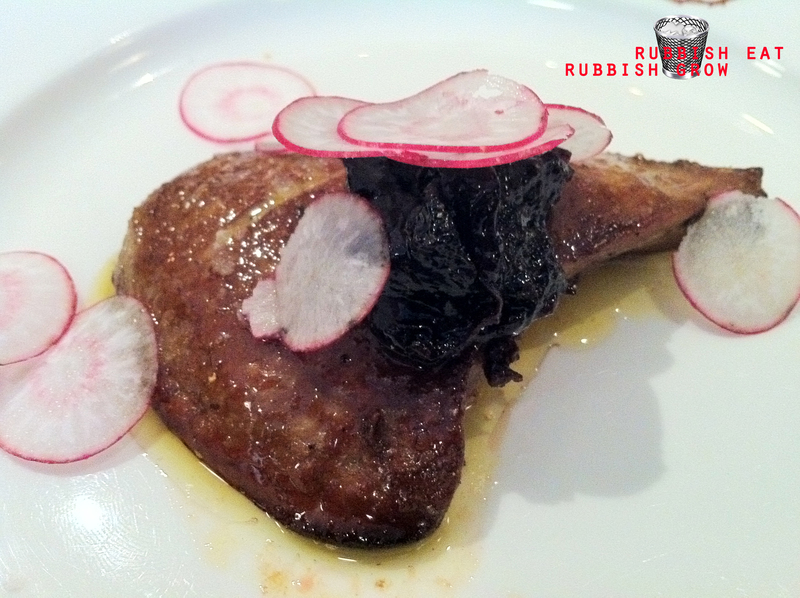 Look at the ginormous size of the Foie Gras with prune compote (add $6)!!! Value for money!! Given the size of it, I forgive it for not being the best quality, a bit mushy at parts although it’s cooked even better than Les Amis. Not overcooked, firm, not overly oily, with the sweet and slightly sourish prune sauce complimenting the rich creamy taste of foie gras. 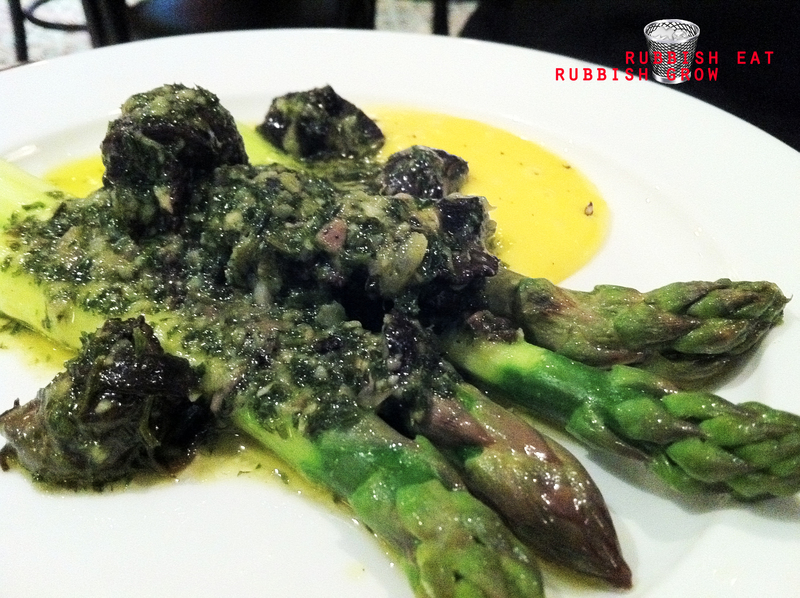 Mao Mao missed eating snails from his farmland in China so he ordered asparagus with Burgundian escargot & hollandaise (+$4). I found the escargot a bit tough and having an earthy smell but he enjoyed it throughly. 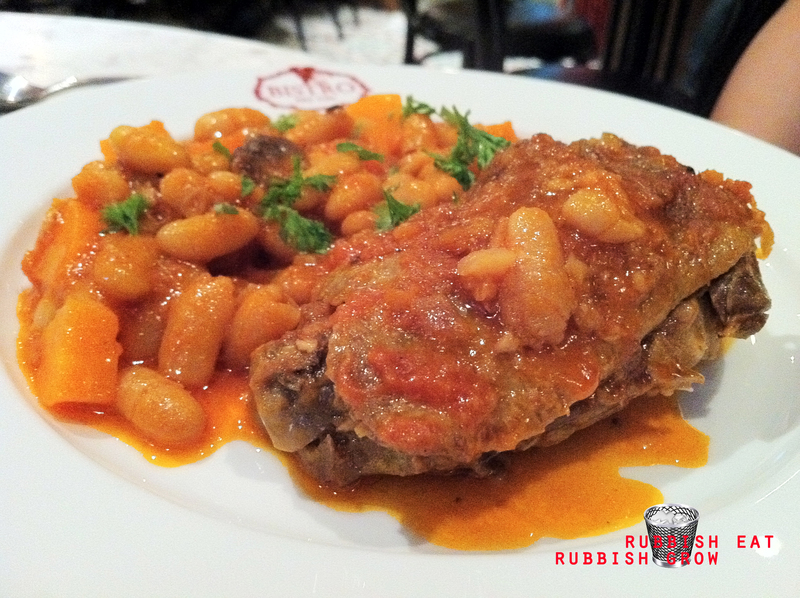 For the mains, Mao Mao’s braised duck leg with lingot beans gave him great satisfaction. 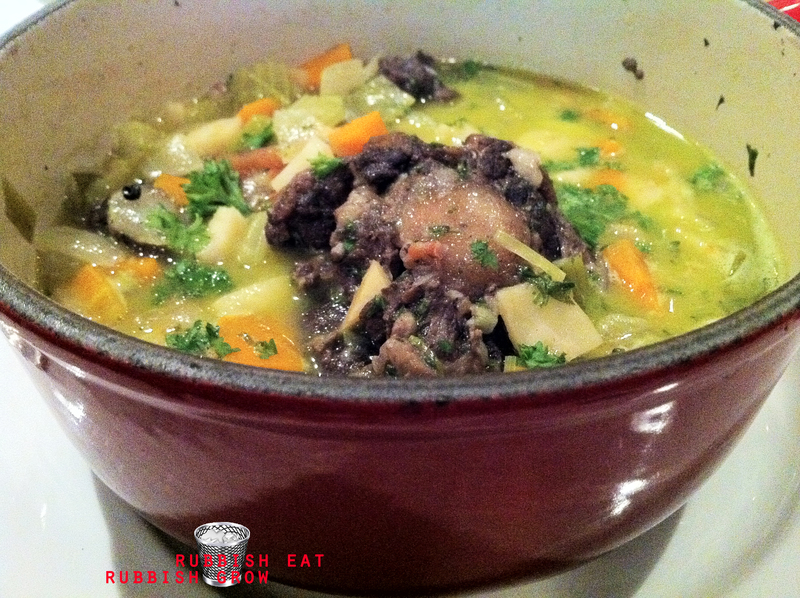 But my braised oxtail with vegetables broth & garlic butter (+$4), coming in a casserole, is such a pleasant surprise. It was rather bland, tasting of vegetable broth, but it grew on me and evoked strong emotions. It felt very, very homey, very countryside. I’d imagine, next time I have a home, I’d cook a dish like this. The more I ate it, the more familiar I found the taste, the more I want to cry, the more I long for a family. The food also came piping hot and in huge portions, very rare in a classy restaurant. 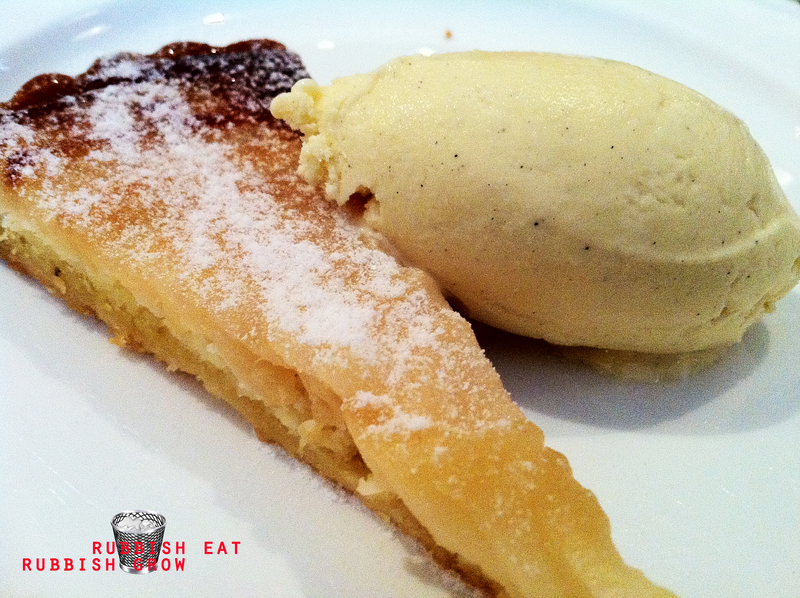 For desserts, we both chose warm pear tart with vanilla ice cream. Thought the tart wasn’t warm enough, and didn’t match up with the appetizers and main course. The vanilla ice cream, homemade of course, was awesome though. Overall, the meal was very heartwarming and homely; the food shows dedication and a love for cooking. Mao Mao, possessing kampong spirit, enjoyed the meal so much that he requested to see the chef to compliment him! Chef Dalton Fong told us at first he didn’t know much about French cuisine but he went to France to taste the food there. And what a great achievement for him! The food was indeed as French as it can get (I lived in France for two months). Chef Fong is very down-to-earth and humble and friendly. Another person I want to compliment is the manager of the restaurant, Ms Catherine Piong. She manages the restaurant superbly. Our glasses were never less than half full with water. The dishes always arrived hot. And she eludes a very easy friendliness without being intrusive or sycophantic. She’s genuinely happy to do her job. I hope Les Amis gives her a huge raise, she certainly deserves it!